Located at Zhongshan City, the hinterland of the Pearl River Delta, Zhongshan Greenerymoss Horticulture Co. Ltd enjoys a favorable traffic network including Zhongshan Port, Beijing-Zhuhai Expressway, Jiangmen-Zhongshan Expressway, Coastal Expressway and No. 105 National Highway. 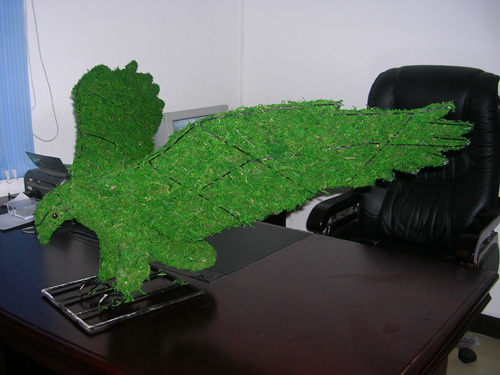 Zhongshan Greenerymoss Horticulture Co., Ltd. is a company specialized in the professional production of gardening products including lichen and hardware gardening products such as sphagnum moss, green moss, mountain moss, iron-made animals, iron-made flower bracket, lichen-like animal, lichen basket, etc. With years of development, the Company has established a nationwide network for collection of raw materials so as to provide our customers with a rich variety of raw materials at a comparatively low price. Well-equipped professional designers and production staffs who has rich experience in this circle, the Company is capable for self development of gardening products. As a result, the Company has obtained a number of Chinese patents and is able to provide novel products to the customers. Since establishment, the Company has been adhering to the motto of “Quality First and Service Foremost” to provide our valued customers with beautiful products but at a lower price. Under customers’ support, our products have been sold to many counties and regions in East Asia, Southeast Asia, Europe and America.